Steve Farley came to Tucson 25 years ago and has represented the city in the state legislature for 12 years. 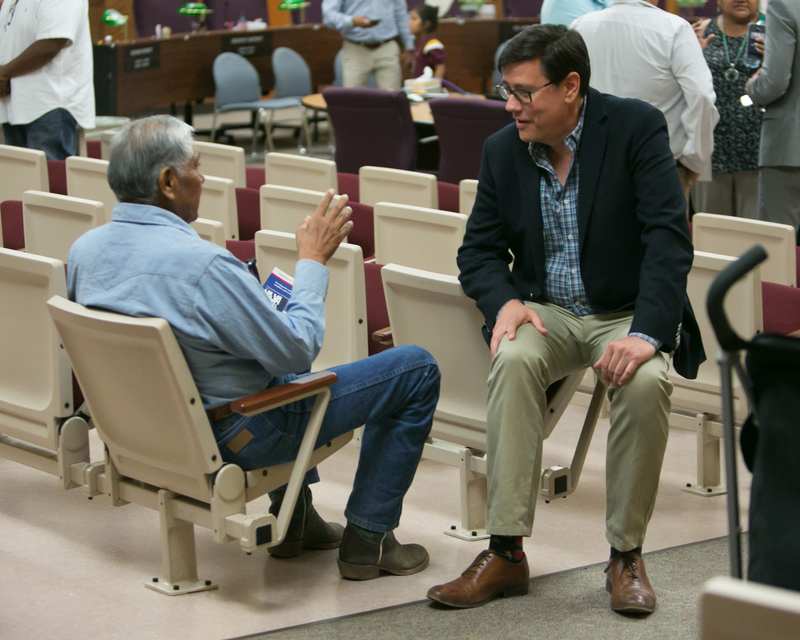 Veteran state legislator Steve Farley announced today that he is running for Mayor of Tucson, so that he can protect the city from attacks by the Trump administration and the state Legislature. He pledged to create a construction job training program for young people, to fight climate change and to protect migrant and asylum-seekers. 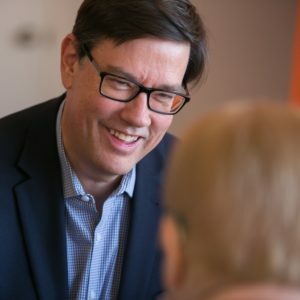 Farley, age 56, has been a popular Democratic state legislator for 12 years, and his last day in the state Senate is January 13. He also ran for Governor in an unsuccessful primary bid. He operates a graphic art studio in Tucson and has created public artworks around the city. Farley is endorsed by Congresswoman Ann Kirkpatrick, former US Senator Dennis DiConcini, community activist Yolanda Herrera, and businesswoman Rebecca Wicker, owner of Dedicated gluten free bakery. 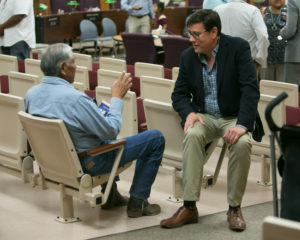 See Stevefortucson.com. Regina Romero, a city councilwoman for 11 years, has also announced a run for mayor. Farley has helped refugees to assimilate since 2015, pushing against the anti-immigrant policies of Trump and Gov. Doug Ducey. He founded Arizona Welcomes Refugees, which holds a weekly potluck dinner at Grace St. Paul’s Episcopal Church and has organized welcome parties of at Arizona airports. Farley has grown the group to 4,000 members. “At our potluck, refugee families come and people who’ve been here longer as Americans come together. People create friendships to help people settle into their new country. These people are so grateful to have a safe haven. This is where energy for our society comes from,” he said. In 2016 a state legislator complained about Tucson’s gun safety ordinance that included destroying guns used in crimes. The state brought a case to the Arizona Supreme Court, which ruled against the ordinance in 2017. Similar complaints ended Bisbee’s ban on plastic bags, and Tempe’s voter initiative to expose dark money. Tucson Water anticipates that in August, the US Bureau of Reclamation will find that the water in Lake Mead has dropped to a Tier One Shortage, meaning that the state’s water supply will be cut by 12%. “We are on ground zero in Tucson, and we’ve got to expand our green energy and solar energy programs. There is a lot we can do to help people insulate their homes, use less fossil fuel and save money,” Farley said. Specifically, Farley proposed a job training program for young people to learn constructions skills by refurbishing the city’s aging housing stock, retrofitting houses with good insulation, and enabling seniors to stay in homes and live independently longer. “We can do this together to solve the job shortage in the construction industry and to give people training, by working with Pima Community College, building trade unions, and construction companies. We get a lot of things done for a win-win solution. That’s something the mayor should do,” he said. Farley was instrumental in winning voter approval by a 60%-40% margin for the Regional Transportation Authority’s (RTA) $532 million program to improve roadways, transit, safety, cross-town mobility and reducing congestion — including the modern streetcar. He worked across the aisle with then-Governor Jan Brewer to expand Medicaid to 400,000 people in poverty in 2014. Farley worked closely with teachers in the 2018 RedForEd movement, to obtain $415 million in new state spending for teacher pay raises and reducing class sizes. He also posted photos of residents of Barrio Anita and Barrio Hollywood at St. Mary’s and I-20, artwork on Grande Avenue, at the Tucson Botanical Garden and even murals commissioned by the Bishop of Tucson at a cemetery of people from the 1870s. Steve is a mensch. Glad he’s running and I hope Tucson picks him. Steve ran for Ward 6 Council in Sept. 2005 in the Dem primary, losing to Nina Trasoff, who then upset Republican Councilman Fred Ronstadt. T Weekly reporter Jim Nintzel remembered this on the John C. Scott radio show yesterday. This launched Steve to run for LD 28 State House in 2006, and win.